Ann Mock lives in Florida with her husband Dave and her faithful companion Happy. She enjoys ballroom dancing and cruising on rivers and oceans in Europe and the United States. Some of her favorite trips were on a Mississippi steamboat which visited sites that inspired her in the writing of this novel. "When God closes a door in your life, he opens a new window." Laura didn't know if she particularly believed in that old saying. She had suffered so much in the last five years since her marriage abruptly ended. Laura has a secret pertaining to her short marriage. When her father becomes ill and reveals their estate is to be sold upon his death, Laura fears her secret will get out and end any happiness the future may hold. Will Laura's secret be revealed or will God open a new window? Laura and Gerald had been sweethearts since they were children. When that love grew as these two grew into adults, marriage happened with so many hopes for their future. Even though Gerald’s parents didn’t agree with this marriage, life was good for these two young people. That is until the tragic death of Gerald turned Laura’s world upside down. Her father-in-law had the marriage annulled, like it didn’t happen at all, leaving Laura alone, with her own secret that could never be revealed. I loved this heartfelt story and enjoyed following Laura on her journey of healing and finding love and peace again after the tragic death of her husband. The Union of the North and the South is such a sweet love story between Laura and Gerald, and the shock of Gerald’s death was just really sad and a difficult part of the book for me to read. My heart ached for Laura, but I enjoyed her attitude and determination to make difficult decisions in her situation. Laura and little Jenny had such a sweet and heartwarming relationship, they stole a place in my heart. When Laura started having feelings for Bradford, I could feel her pain and guilty feelings because she still loved Gerald. I love the way author Ann Mock weaves their feelings together, creating a beautiful, heartwarming romance that worked so well with the historical setting. Though this is a story that everyone would love, I think The Union of the North and the South would be a wonderful read for those who have lost their mate, especially early in their marriage. Following Laura’s story describes the feelings of losing your loved one, and clearly takes readers through each step of the healing process. This is a most beautiful story that I highly recommend. The Union of the North and the South by Ann Mock brings romance alive in the 1870s. A novel with Christian themes, this romantic story takes place in the South. We meet the Malcolm family and find them in their home that shows their courage, strength and overall ability to survive. Laura must overcome personal tragedy and hide a secret that will cause her more heartache than one could imagine. In the end, however, she must confront the secret and make enemies become friends - all while trying to find the power and strength within to discover love again. This is a touching story that hits within my heart on many levels. Laura has to overcome a lot in her life and she is a character that I find myself identifying with. While I am not a lady of her time and never had to handle a war and those kinds of enemies, I have had to overcome secrets that caused hurt among parties. When you connect with a character you feel their story that much more. This was a fast read and a touching one on many levels. It is a romance without too much romance to it and it is what is known as a clean romance so you do not need to worry about being offended by anything too much. If you want to believe in the power of love and forgiveness, this is a read for you. I recommend this book to anyone who loves romance and positive themes. In The Union of the North and the South by Ann Mock, Laura was lucky enough to have found love with her childhood friend Gerald. But Gerald's father wished him to marry another woman, one whose financial status would pull them out of the ditch in which the war had left them. Defying his father, Gerald married Laura and they started their happy lives in a beautiful cottage. But then Laura's world was shattered when Gerald died, and his father annulled their short-lived marriage, denying Laura access to any inheritance. Soon Laura discovered that Gerald had not left her alone, but this is a secret that she is willing to guard with her life. Turmoil continues to reign in Laura's world when her father dies and a handsome stranger from the enemy territory kicks them out of their home. Laura must continue to guard her secret, while at the same time resisting the charm of the newcomer whose intentions she suspects; but could he be the one that might finally break her walls down, showing her what it means to forgive and maybe even how to love again? The Union of the North and the South by Ann Mock is a beautifully written romance story about loving, losing, learning to love again, learning to forgive and finding peace through forgiving others. Laura's life is an inspiration, for the sacrifice she made must have required a lot of strong will, but she also knew that she had no choice. Ann Mock brought the characters to life and portrayed them in a way that was so natural. She made them easily relatable. It was easy for me to feel Laura's mixed emotions as she struggled to reconcile the many harsh challenges life had thrown at her in the past, in a bid to make way for the future. The Union of the North and the South is a beautiful story with an inspiring theme that only after we reconcile our past can we have a chance at a bright future. I never really got into history when I was in school but this book made me rethink that. It was fascinating to read about these fictional characters in such a real way. The past came alive through the pages and I couldn't wait to see where the author took them. Part of the story is sad as the main character has to go through a lot of loss. But she comes through it with gumption. It was fun to see the authors plan for the storyline coming together. 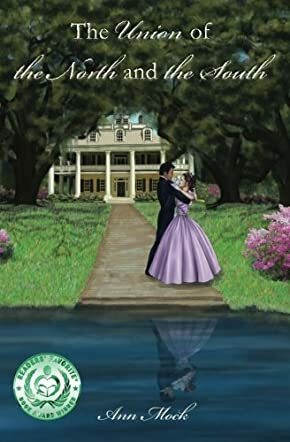 The Union of the North and the South is a wonderful story set in Vicksburg, Mississippi in 1875. The author beautifully draws the reader in with warmth, adventure, ambiance, and intrigue. Every now and then there is a gentle turn of words that made me as a reader want to pause for a moment to drink them in. It’s a story about love, loss of love, and newfound love mingled with misunderstanding and forgiveness. Unexpected twists and turns brought heartfelt smiles. I found this tender book delightfully feminine and a wonderful world to get lost in.